Suzanne McNeill is the author of more than 200 craft & hobby books, including Joy of Zentangle, The Beauty of Zentangle, the 11-volume Zentangle series, and Zen Mandalas. 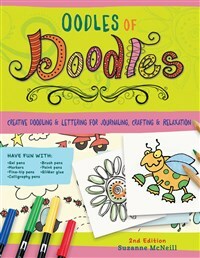 Suzanne founded the leading publisher of Zentangle books, Design Originals (an imprint of Fox Chapel Publishing). She was voted “Designer of the Year” and received the “Lifetime Achievement Award” from the Craft & Hobby Association. Suzanne has been called "the trendsetter" of the arts and crafts industry. - Tonya Bates spends her time creating crafts and fine arts. She enjoys paper crafting, painting, sculpting, ceramics, drawing, decorating and playing the piano. Many of Tonya's beautiful designs have appeared in craft books. - Emily is the Education Director of Imagination Project, the artist behind their production line, Circus Rose, and co-designer of Project Essentials. She has been a CKU professor since 2002 and teaches all over the US, as well as internationally. Emily has been published in scrapbook magazines and has been featured on ten DIY Scrapbooking episodes. - Jaime has been teaching and crafting for the past 20 years. She loves portrait photography and finds that scrapbooking allows her to combine her photographic interests with her passion for beautiful papers. Jaime designs papers and templates for The Crafter's Workshop. You can see more of her designs or contact her at www.thecraftersworkshop.com. - Donna Goss is an innovative and energetic multi-media artist. She has created stamp art since 1992. Her talent repertoire includes, soldering, collage, scrapbooking, beading, jewelry and metalwork. - Andrea Gibson designs jewelry, layouts, and cards and teaches at shops, workshops, and Scrapbook shows. - Cyndi Hansen has been crafting all her life. She has worked as a craft designer and as a florist. Cyndi loves designing album page ideas and projects that add flair to memory books.